Every school year, I think about new ways to ignite a spark in dormant readers and re-energize the passion in active readers. My focus this year has been improving my students’ access to books, and one way I have done that is through a Read & Ride program in the library. 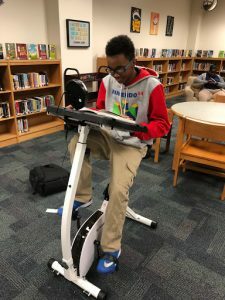 By providing an area where my middle schoolers can read while they cycle on stationary exercise bikes, students have improved their focus, attention, and mood as they read. I purchased two FitDesks and updated my audiobook collection with current titles. 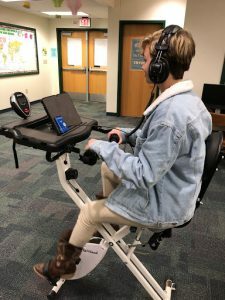 I chose FitDesks for several reasons: they are economical ($250 plus an inexpensive extended warranty); they make almost no noise; they are lightweight and can be easily relocated; and they can be adjusted for students who are under five feet tall. FitDesks also have workspaces so that students can read books or listen to audiobooks. The workspace also easily accommodates a tablet or laptop for ebook access. Kids typically lead very physical lives, but as the academic workload intensifies in middle school, too much of students’ academic lives become sedentary. By combining exercise with reading, my students experience several health benefits. A reading workout on the FitDesk affects the brain by increasing serotonin, dopamine, and noradrenaline levels. The rush of neurotransmitters help students focus their attention and improve their reaction times. Students will return to class with more than just a library book; they will return with a more focused and attentive brain. The FitDesks are equipped with performance meters so that students can track their time, speed, distance, and calories burned. A read & ride session typically lasts fifteen minutes, and the meters can be reset for each ride, except for the total mileage on the bike. Students can adjust the tension on the bike if they want an easy or difficult ride, but my students are instructed not to exceed 20 mph. Students are not limited to what they read or how they read it, but a very high speed makes it difficult to focus on the reading material. The performance meters make Read & Ride challenges possible. I held a Read & Ride competition for both students and teachers to win book fair gift certificates. The top three students and teachers from each grade with the most mileage won. Students are always eager to share their mileage with me after they get off the bikes, and I track the results in a spreadsheet. For the safety of the students, it’s best to inspect the nuts, screws, and knobs on the bikes on a weekly basis. Stationary bikes are an easy way to implement fine forgiveness. My students are allowed to check out books even if they owe lost/damaged book fines, but I wanted to promote a fun way for them to take ownership of their education. Students can read & ride away lost/damaged book fines at the rate of $1.00 per mile. There are no reading logs that I have to keep track of, and I do not have to worry about whether students actually do the reading because they are reading in front of me. An amnesty program like this means that I do have to replace a lot of the same books every year. Providing my students with consistent access to quality books is worth the cost. If you are looking for a way to get students’ hearts pumping for literacy, invest in a Read & Ride program! Congrats, Sara, on an innovative program in your library! Here in Okaloosa County, unfortunately, our media centers are not staffed consistently due to staff reductions in the schools. They are staffed with Library Assistants, not degreed media specialists. Often their time is divided with a host of other duties. This situation makes it tough to implement cool programs like yours. I’m wondering, do the students have an opportunity to come to the library during school hours to participate? And is your center open after school hours?Again, congrats! Sorry to hear that your county doesn’t have media specialists. Is your county involed with FAME? They will advocate on your behalf. My library is open all day, and teachers write passes for students to ride the bikes. I don’t have formal after school hours, but I am usually there after school if students needed anything.